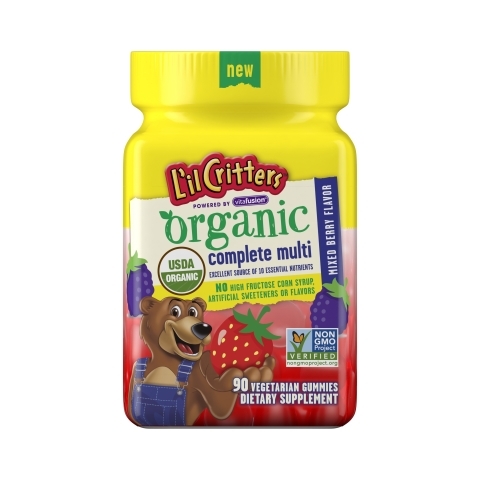 EWING, N.J.--(BUSINESS WIRE)--L’il Critters™, America’s #1 kids gummy vitamin brand proudly introduces L’il Critters™ Organic Complete Multi made with 11 essential vitamins in a natural mixed berry flavor. L’il Critters™ Organic Complete Multi provides a wholesome fusion of nutrients, USDA certified organic ingredients and Doctor-Tested proven nutrient absorption for vitamin C. These power-packed vegetarian gummies are certified by the America Vegetarian Association delivering nutrients kids love and parents trust. These, non-GMO Project Verified organic gummy vitamins, contain no artificial flavors or sweeteners, no synthetic (FD&C) dyes, no high-fructose corn syrup, no gluten, no dairy, no soy, nuts, fish, or sugar coating, because what’s not in your gummy vitamins is just as important as what is. No wonder Kids Love ‘Em and Parents Trust Them! L’il Critters™, America’s #1 kids gummy vitamin brand proudly introduces L’il Critters™ Organic Complete Multi.